Editor’s note: Browns beat reporter Fred Greetham will break down the Browns roster on a position-by-position basis, starting with the quarterback position. Hoyer (6-2, 215, 28) — Hoyer was inactive as the third quarterback for the first two games of the season before being elevated from third-team to first-team when Weeden was injured. Hoyer started the next three games and the Browns won all three games before being lost for the season with a torn ACL. Hoyer’s abbreviated season finished 57-of-96 for 615 yards with five touchdowns and three interceptions for a rating of 82.6. Hoyer’s emergence provided a spark for the Browns as the team had three of their four wins on the season with him at quarterback. Unfortunately, Hoyer was injured and the sample of his play, although limited, should allow the Browns to not have to rush a rookie quarterback into the lineup in 2014, provided he recovers fully in time for the season from his injury. Campbell (6-5, 230, 32) — Campbell ended up having a very up-and-down season. He started as the backup to Weeden, but was bypassed by Hoyer to be the starter when Weeden was injured. After Hoyer was lost for the season and Weeden was ineffective, Campbell became the starter against the Chiefs. Despite a loss, Campbell had a 105.4 rating and passed for 293 yards. 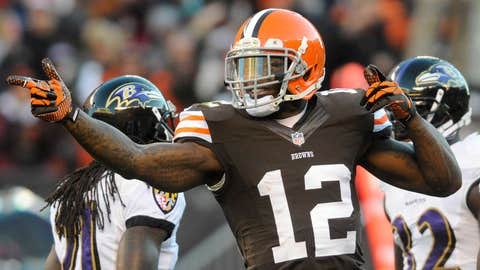 The next week, Campbell led the Browns to a win over the Ravens and was AFC Offensive Player of the Week, in what turned out to be the Browns final win of the season. He then had sub-par performances and suffered a concussion against the Steelers. After missing the next game, Campbell came back with a career-best 391-yard performance against the Patriots. He closed out the season with three lack-luster performances in losses to the Bears, Jets and Steelers. On the season, Campbell finished 180-of-317 for 2015 yards (56.8 pct.) with 11 touchdowns and eight interceptions. His rating was 76.9 and he was 1-7 as a starter. Weeden (6-3, 220, 30) — Weeden started the season as the starting quarterback, but was injured near the end of the second game. Weeden was replaced by Hoyer, who captured the job until his injury finished his season. However, Weeden was re-inserted as the starter for two more games after Hoyer’s injury, but after ineffective play he was benched in favor of Campbell. He started one more game against the Jaguars and threw for a career-best 370 yards with three touchdowns, including throwing 261 yards to Josh Gordon in his record-setting game. Weeden suffered a concussion against the Jaguars and did not play the rest of the season. Weeden finished the season 0-5 as a starter, but did play well in relief of Hoyer in the win over the Bills. He finished the season 141-of-267 for 1731 yards with nine touchdowns and nine interceptions and a 70.3 rating. Tanney (6-3, 223, 26) — Tanney spent the first 12 weeks of the season on the Cowboys practice squad, but was signed to the active roster on Nov. 26 after Campbell suffered a concussion. Tanney was active for the first game he was with the Browns as Weeden’s backup against the Jaguars, but did not play. The last three games he was inactive, including the Patriots game when Caleb Hanie was signed the week of the Patriots game and he was Campbell’s backup. Summary: Based on his play and assuming that Hoyer is able to recover in time for the 2014 season from his ACL injury, he would have the inside track at being the starting quarterback. Campbell finished on such a low note it is unclear if he will be brought back. It is almost a given that Weeden will be traded or released before the start of training camp. He was given the opportunity to take the starting job on at least three occasions, but couldn’t hang on to it. Tanney was brought in as a developmental quarterback, but assuming the Browns are using a high draft pick to bring in a quarterback, it is unlikely Tanney would be back beyond the off-season. Looking Ahead: The silver lining is that Hoyer allows the Browns to not have to rush a rookie quarterback into the lineup immediately. He showed what an efficient quarterback can do for a team and an offense. 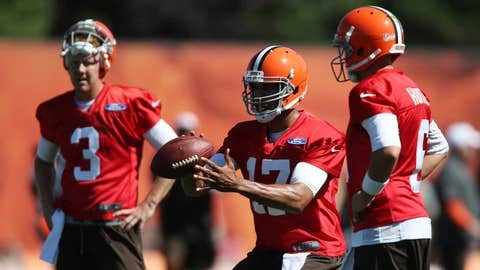 It is no secret the Browns are looking to find their franchise quarterback this off-season and it is expected they will draft one in the first round with one of their two first round picks or even use some of their picks to move up to select a quarterback, if need be. There will be countless hours spent debating if the Browns should take Blake Bortles, Teddy Bridgewater, Johnny Manziel or any of the highly projected signal callers. If they do not draft a quarterback at the top of the draft, they will likely still draft a quarterback with one of their draft choices. The wild card in all of this is who the Browns coach will be. It is obvious that Joe Banner and Mike Lombardi are lining up the personnel, but a coach and his offensive style should play a huge part in who the quarterback will be.